Summary: This was a tough walk that started in the village of Askwith near Otley. From the village I headed north onto open moor. 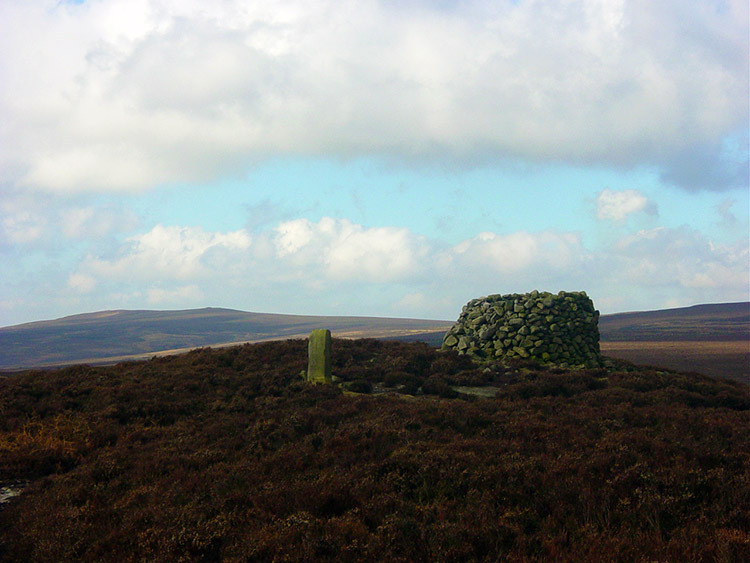 My goal was Round Hill, the highest point on Blubberhouses Moor. The top is only 409 metres high but the going can be tough with lots of heather moor and bog to negotiate. Especially in winter when I did the walk. Add to that the choices I took to visit seldom visited points which meant crossing unmarked ground between paths and you have a gruelling day out. However, that is how I planned it. And for two reasons. Firstly to refine my map and compass reading skills and secondly as a fitness exercise for the 136 mile Yorkshire Dales Celebration Way , a walk I was designing at the time of this outing and one which I would complete later in the year. I set off in beautiful sunshine but it was typical crisp late winter weather. My fitness was as cold as the surrounding air. It was a few weeks since I had last done a walk and in between I had spent a long weekend in Dublin with Lil and friends. We had done some walking around the city, but we had done a lot of non strenuous activities too. Stay off the walking for a few weeks and it tells. 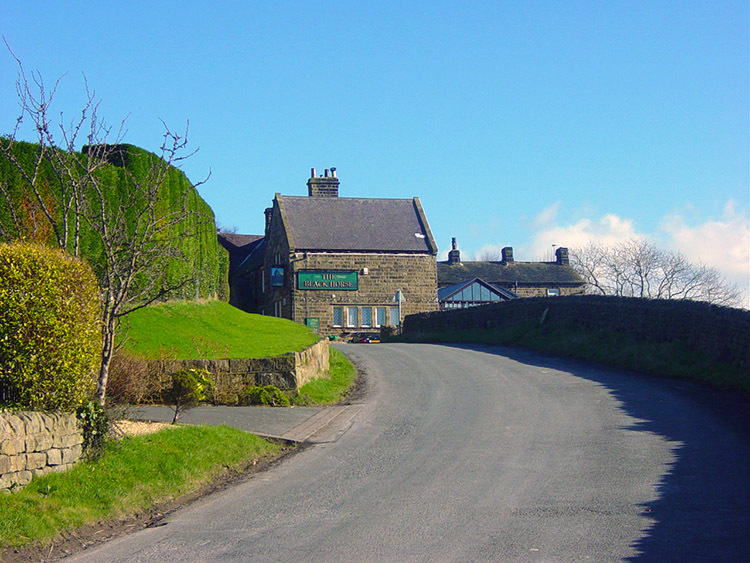 I walked from the lovely village of Askwith to Brick House where I met Peacocks and Geese in the grounds. 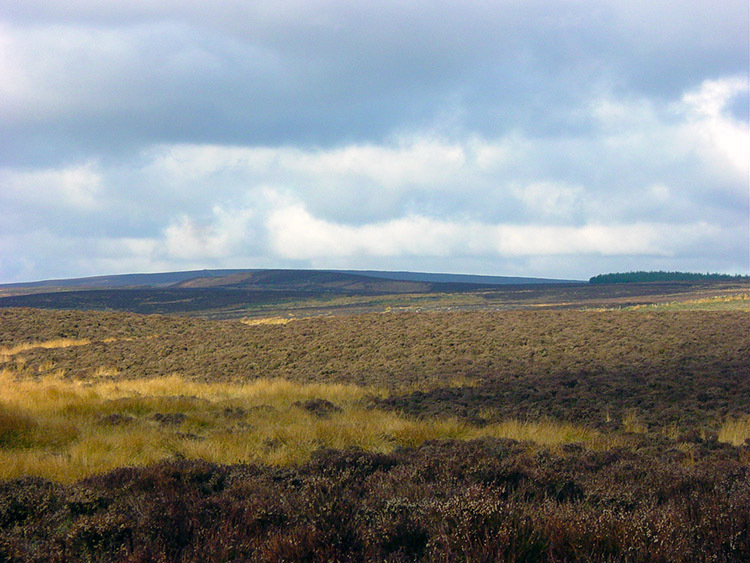 It was to be a day where I encountered quite a few animals for after Brick House I headed due north onto the moorland. I struggled to get myself going on this initial ascent and was puffing my way up to the moor top as a hare startled me, jumping out from the lush low moor grass as I approached. I continued on my climb, getting better as I made height and was just about on form when I reached my first goal, the trig point on Shooting House Hill. The panoramic view was fantastic here as I gazed east to Norwood Top and Almscliff Crag. Turning my head in a clockwise circle I could see Otley Chevin and Ilkley Moor to the south, Beamsley Beacon and Round Hill to the west. 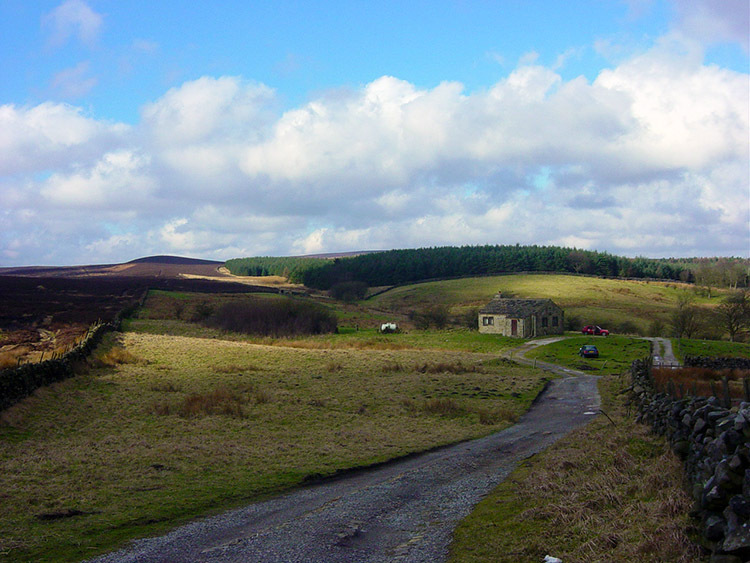 To the north was Timble Ings plantation and then to the North East in the far distance the North Yorkshire Moors. The only eyesore were the monstrous golf balls at Menwith Hill. Some think they are pretty, to me they are yuck. 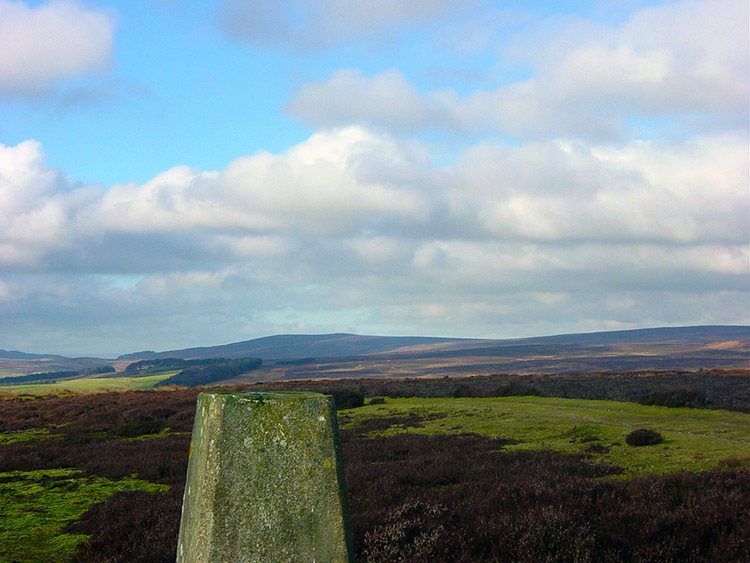 After enjoying the views I took my first compass bearing to cross the moor in order to reach a path. Successfully negotiated I reached the path from where I took a right and pushed on to Ellarcarr Pike. 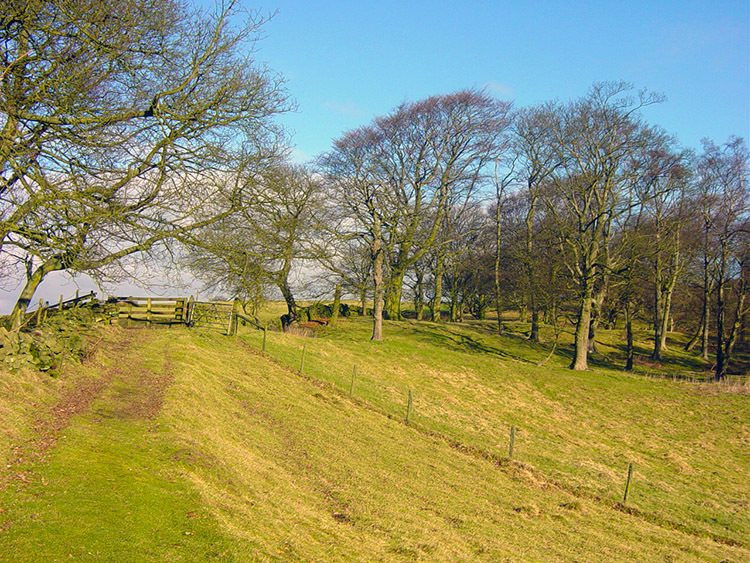 I then made my long ascent of Round Hill on the High Badger Gate Path via Lippersley Ridge. The first couple of miles of the ascent was made on a good footpath but after Stainforth Gill Head the path seemed to disappear. It was certainly less distinct. At this point I had no option but to find my way over heather or through mossy bog. I arrived at the top of Round Hill with soaked feet. Water had got over the top of my boots in some of the deeper bogs. I was jiggered when I stopped for lunch on Round Hill. 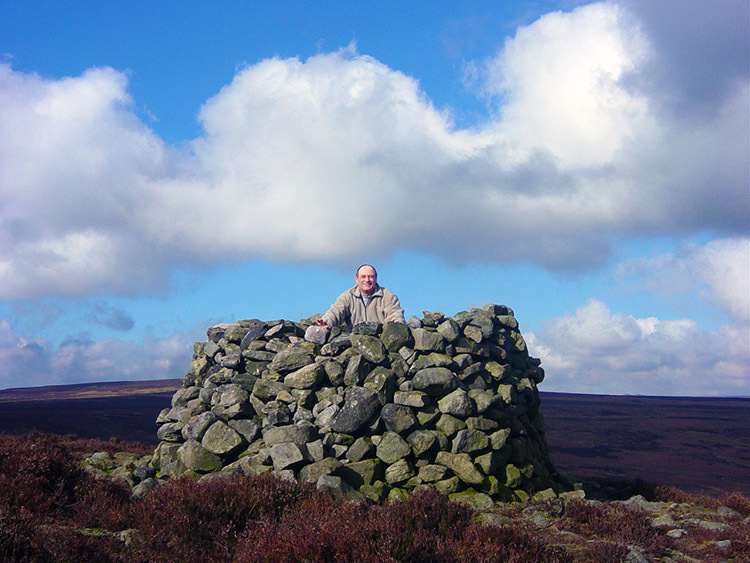 I availed myself of the good round shelter situated on the summit. How I enjoyed it in the wind break as I soaked in the peace and solitude of this quiet place. There was not a sound to be heard apart from the slight breeze whistling through the heather and the noise of airplanes making their descent to land at Leeds Bradford Airport. It was something I could put up with as I rested taking in the sandwiches, orange drink and hot coffee to regain my strength for the walk off the moor. 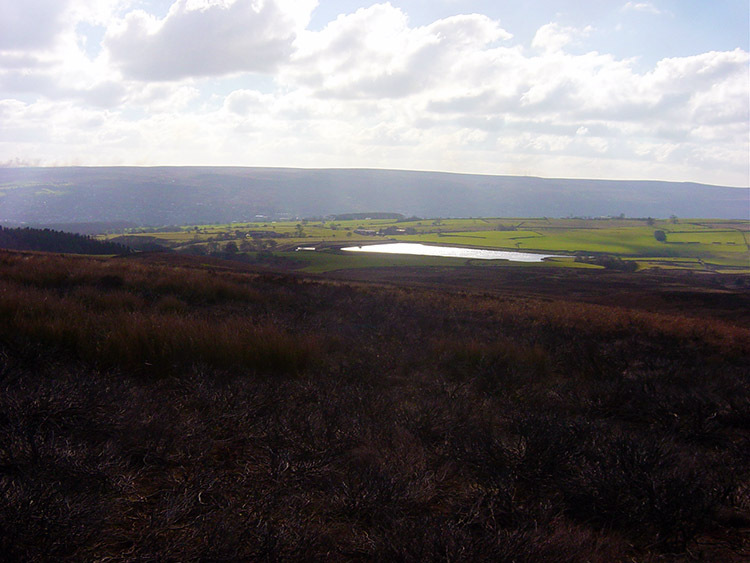 I left Round Hill by tracking south across Middleton Moor towards March Ghyll Reservoir. During the descent I came across some Cup and Ring marked rocks at grid reference SE116515 before heading for home by walking east towards Denton Moor. At one point there were several paths running off the moor and I had to take another map and compass bearing to make sure which was the right one. My aim was to reach a point where I could follow along the edge of Cross Bank Plantation which I reached as planned. 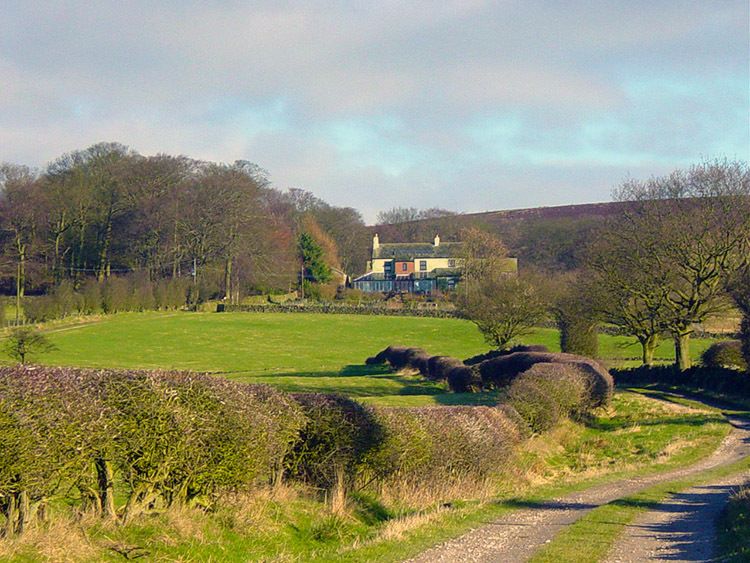 It was now a simple case of following the plantation east on the fringes of Denton Moor until its end. I left the moor and walked down into pasture fields passing a house called Dunkirk. 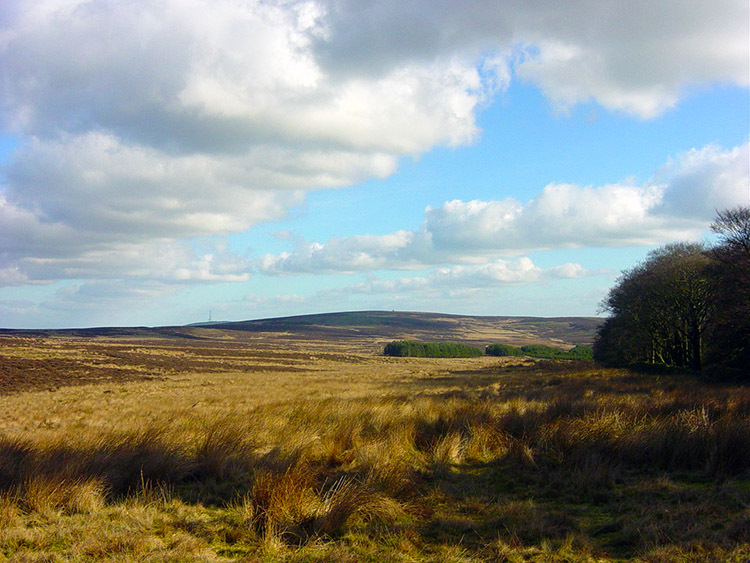 It was pleasant walking now and just as well for I was feeling the effects of the trek on the moor. I walked, not with any haste, but at a leisurely pace until I reached Scales House Farm. 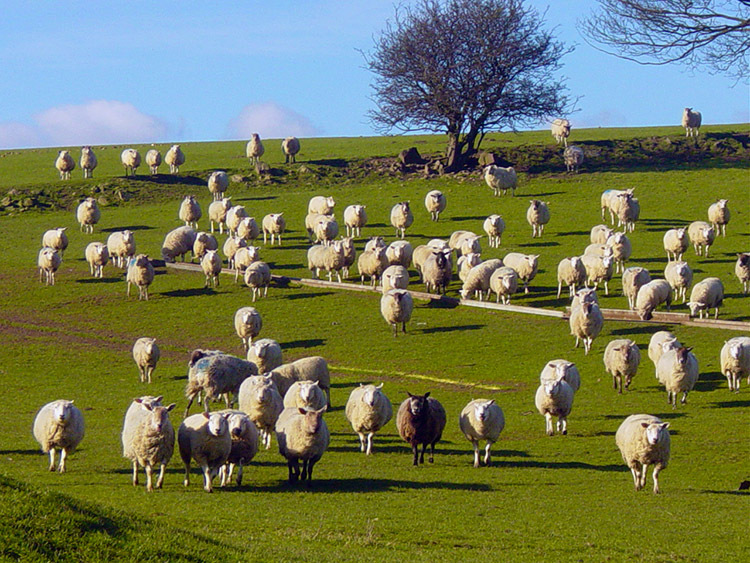 Here I crossed into a field with sheep in the far corner. I was walking away from them when suddenly I heard a stampede rushing towards me. They were running towards me like ballyhoo. I wondered what was going on and then realised I was wearing a white fleece. the same thing had happened to my wife Lil when she had been wearing her white fleece during a recent walk. Weird animals, I do not look anything like a sheep. After spending a moment looking at them and taking the picture I made on my way back to Askwith. And so I arrived at the car after 13 miles with a swollen ankle and a stiff knee. 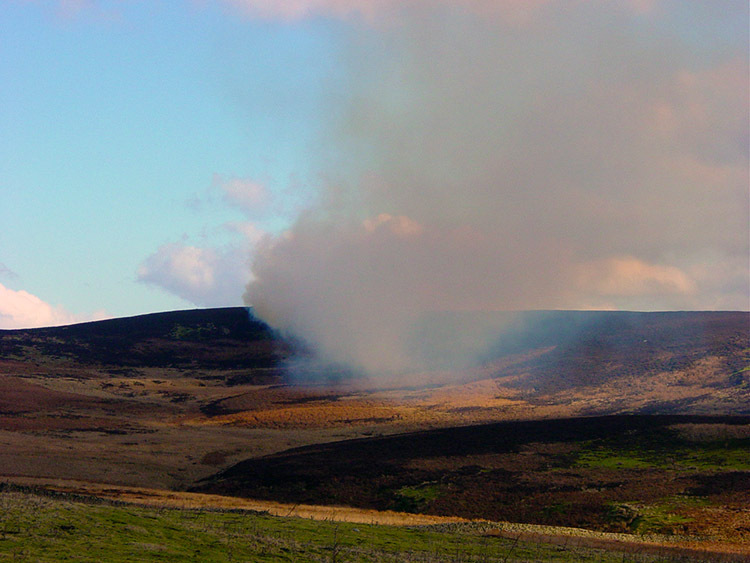 All thanks to the moorland. But boy, did I feel good. Tired yet exhilarated.